Each group of people have customs that are unique to them. However, in all ethnic groups throughout Africa, the family unit is of the utmost importance and it is reflected in the customs of each tribe. One traditional custom in African culture is that of lobola, where the groom pays the father of the bride in order to compensate for the ‘loss’ of the man’s daughter. Traditionally, lobola was paid in cattle, a valued commodity in many African cultures, but today many modern couples pay lobola in cash. Lobola is intended to bring together two families, fostering mutual respect. It also indicates that the groom is financially capable of supporting his wife. The negotiations of lobola can take up to two days. The wedding is held at night when the moon is full. It is considered bad luck if the wedding takes place when the moon is not bright. The wedding celebrations can last several days but the bride’s parents do not attend because it is too sad for them and the event is intended to be a joyous one. A man can have as many wives as he can afford and the wives share the responsibilities of the daily chores, such as babysitting, pounding corn, preparing meals and washing clothes. The practice of polygamy brings more families together and deepens the interest of the welfare in others. The protection of the family is the core value in most African tribes. Members in the tribe care for one another, share wealth and food and assure that no child is abandoned. In African culture, a child learns at an early age how to become a good member of his tribe. Each member of the tribe belongs to an age group that has special services within the tribe. Each person is expected to contribute to the tribe by doing his share of the work and obeying its customs. The rite of passage is a controversial African custom that varies from tribe to tribe. 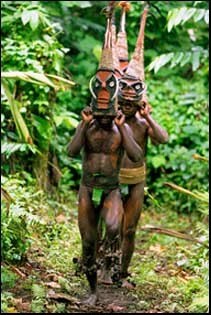 Circumcision, which is usually performed on males is, in some cultures, performed on females as well. The ritual is usually spread over a period of several months and the one being circumcised is forbidden from screaming or crying because doing so is considered cowardly behaviour. The African customs of tribal circumcision has often caused mutilation and even death. The victim seldom seeks medical care from a hospital because they are often abandoned by their family and their tribe for doing so. It is believed that complications arising from circumcision are the fault of the victim because they are either being punished for having done something wrong or they are too weak to be qualified as men. Click on the links below for detailed information on these topics relating specifically to Zimbabwe..